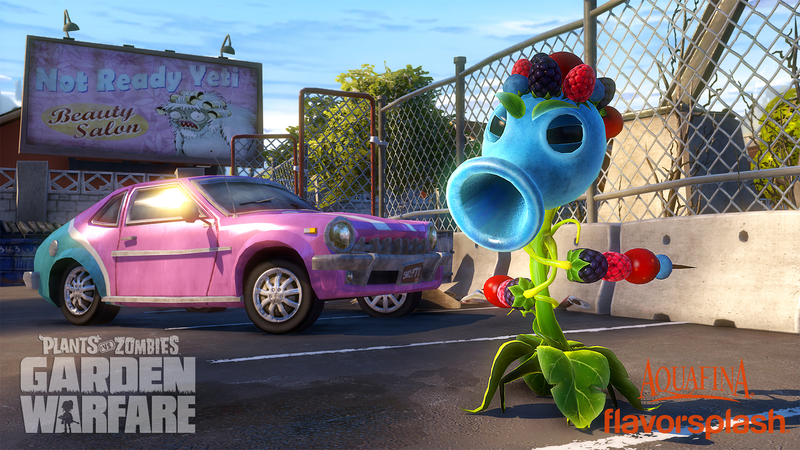 Two new free Plants Vs. Zombies: Garden Warfare character variants drop today, courtesy of Aquafina FlavorSplash. How do you feel about free sponsored content? The Berry Shooter and Citrus Cactus arrive today with the free Tactical Taco Party Pack downloadable content pack, the latest in a series of free premium content added since the launch of PvZ:GW earlier this year. It includes a new map, a new game type (this arrives July 8 on PC), and two new characters evocative of the fresh taste of Aquafina FlavorSplash brand water product. The only problem I have with the sponsored content here is that it's only for the Plants side of the conflict. I guess sponsors tend to shy away from being associated with rotting corpses. As long as I don't have to stare at a product logo all day, aren't assaulted by in-game signage (one here and there, as it makes sense is fine), and I remain free to mercilessly taunt anyone who uses the fruit water plants in a match against me, I don't see the problem with Pepsi's fruit water making an appearance, as long as Sun Chips aren't next.